Adding a Network Drop can be intimidating depending on the location and how the wires are run. If you are OK with matching wires to connectors and finding the right wire the essence of the job won’t be too difficult. 3 Which Wire Goes Where? 4 What Kind of Wire ? 5 Where Do You Want the data Drop? 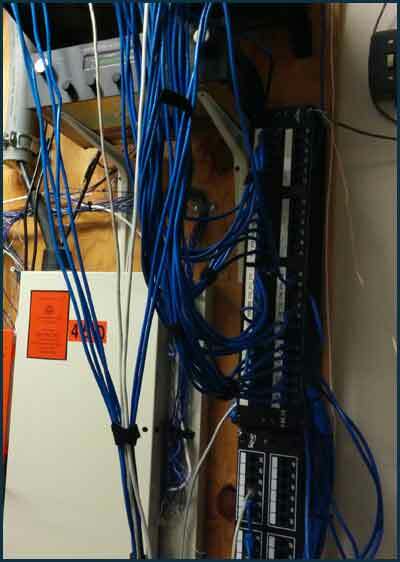 When you look at the overall plan it’s simply a wire from point to point with properly terminated connectors. That doesn’t mean the wire will be that easy to run since you may have to “fish” the fire through the attic/drop ceiling, and wall. 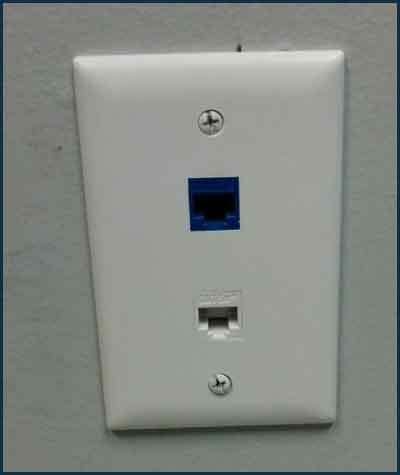 You will want to add a data cable into an existing outlet or add a new outlet. 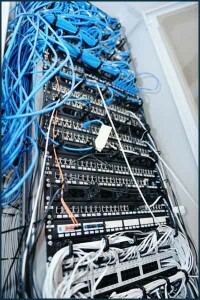 If the wiring closet looks like the picture, you may wonder where to even start. Pulling cables can be accomplished with a single person but it is much easier to do it with a second person. The additional person doesn’t have to know how to add a network drop but they can be very helpful in keeping the wires from tangling. If you end up adding the network drop alone, be prepared to go back and forth and up and down on ladders. 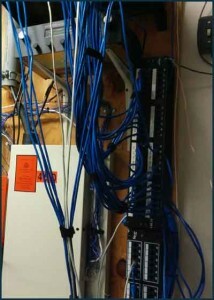 and phone wiring will be in the same closet. If you are lucky the last installer left you a clue as to the endpoint of a wire. Be kind and leave some sort of documentation for the next person. Ideally you should leave a label on cables and/or outlets. If the network wire is going through the ceiling then you must use plenum wire. It’s much more expensive and may be more difficult to use. Downs Consulting suggests uses a box of cable since this is less likely to tangle. if you are forced to use a roll, prep the cable by winding on a cable roll. If the wiring will be exposed then you need exterior grade cabling. 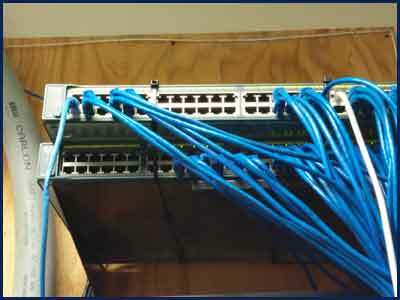 If you are installing a new network then CAT-6 makes sense since you will have the best network backbone. Your network will only be as fast as the slowest link. Wiring is the most difficult component to change so opt for the best on newer networks. An older network will likely have CAT5E components so there’s no need to use the more expensive CAT 6 in this instance. Where Do You Want the data Drop? If you are adding to an existing outlet then you will probably need to fish cable through conduit to the existing outlet and replace the wall plate with one that provides another port. Fish sticks and tape are good to have for these sorts of jobs. Fishing wire into an existing outlet is the preferred install but it may take a bit more time. 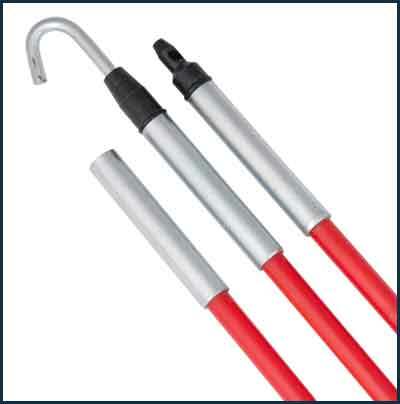 Fish sticks are great for fishing up wire through walls if there is a enough room to maneuver them in the outlet box. If the conduit comes in at an angle you may find it near impossible to get your fish stick through it. It may be better to drop string down from the top with a fishing weight. If it is an exterior be prepared to cut through insulation and stay well away from any electrical runs. This could be messy so opt for the surface mount box if it’s acceptable to your customer. If there are already surface mounted conduit then one more box is not going to change the appearance. You can add wire channel to cover the exposed network wire or leave it exposed if it’s exterior rated wire. Fishing the wire through a new outlet should be much easier since you can install low voltage boxes. Lots of room to maneuver your fish of choice.